Knot tying is a basic surgical skill. As the indications for arthroscopy have expanded, attention has turned to how arthroscopic surgery compares with open surgery, so the ability to tie secure knots arthroscopically is essential for surgeons who wish to achieve results comparable with open repairs. Though the principles of open and arthroscopic repair are the same, arthroscopic knots are more difficult than hand-tied ones. 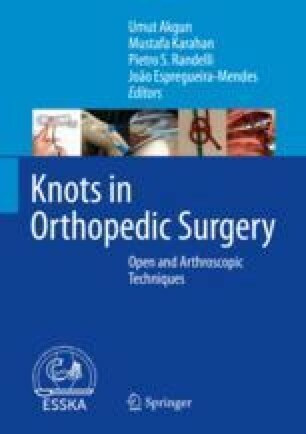 Despite the large number of knot options and suture types, most of the time the choice of the knots is not based on scientific evidence but on empirical data and surgeon’s preference. The present chapter reviewed different arthroscopic knots and their biomechanical properties. Baums MH, Sachs C, Kostuj T, et al. Mechanical testing of different knot types using high-performance suture material. Knee Surg Sports Traumatol Arthrosc. 2013. https://doi.org/10.1007/s00167-013-2711-9.